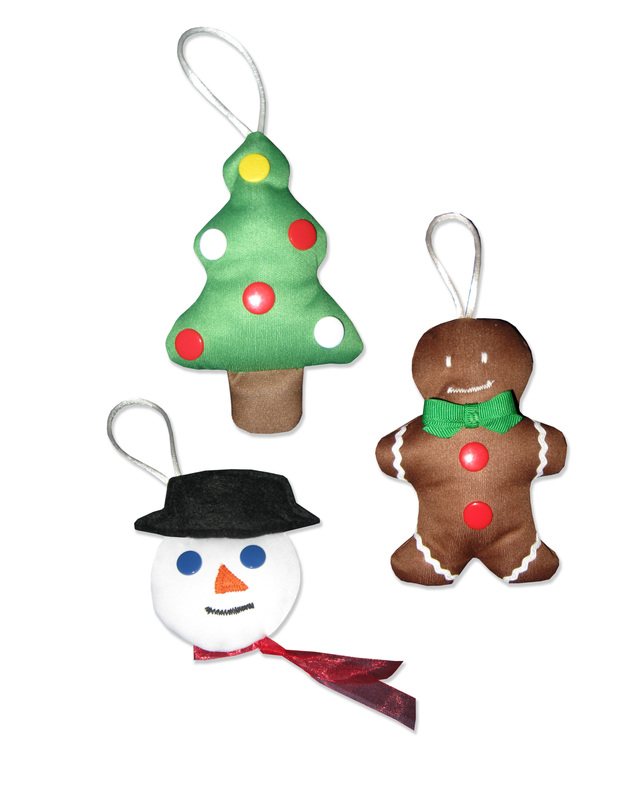 You’ll love making these fun ornaments with Babyville Boutique PUL. This tutorial will show you how you can use up left over diaper sewing PUL and make these special little guys for your tree! 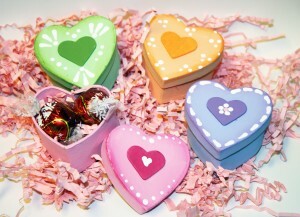 Special thanks to Joanna at Weensy Baby (http://www NULL.etsy NULL.com/shop/WeensyBaby) for sharing them with us! Babyville Boutique Snaps- 6 caps and 6 sockets or studs, 1 yellow, 2 white and 3 red, or colors of your choice. 1. Cut out paper Tree pattern. It does not include seam allowance. Using a ballpoint pen, trace the tree on the back (laminate) side of the Green PUL. Mark snap positions. Apply snaps to the treee with the caps on the fabric side of the PUL. Cut tree out, adding desired seam allowance. 2.Trace the trunk pattern on the laminate side of the Brown PUL. Fold the PUL fabric sides together, and sew around the trunk, leaving the top edge open. Trim edges 1/4” away from sewing line, and clip corners. Turn the trunk right side out, and stuff with a little polyester stuffing. 3. Pin the stuffed tree trunk to the fabric side of the tree, centered on the bottom edge. The raw edge should match the edge of the tree, and the trunk should be toward the center of the tree (see photo below). Baste it down close to the edge. 4. Fold the piece of ribbon or cording into a loop, and tie a knot near the ends. Position the loop at the top point of the tree, with center fold of loop hanging down toward the center of the tree. Baste the ends down close to the edge (see photo below). 5. Place Green PUL pieces for tree fabric sides together. 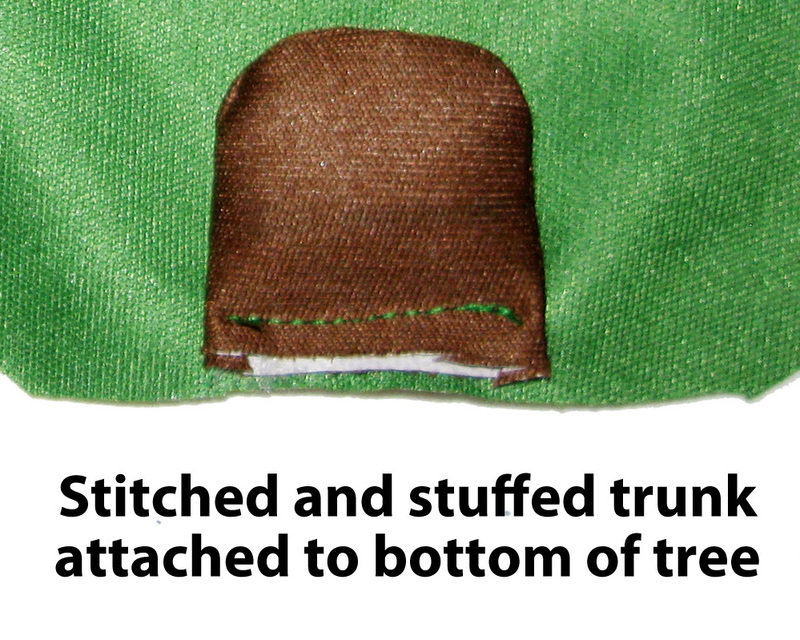 Make sure the loop is inside the tree shape (secure with transparent tape if desired), so it does not get caught in your stitching. 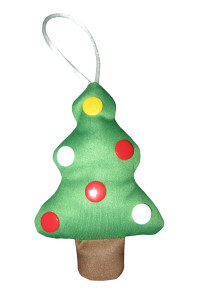 Use a straight stitch to sew around the tree on the marked sewing line, leaving a 1” opening on a straight edge. 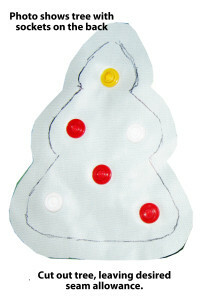 Cut around the tree 1/4” from the drawn and sewn line, clipping corners and curves. 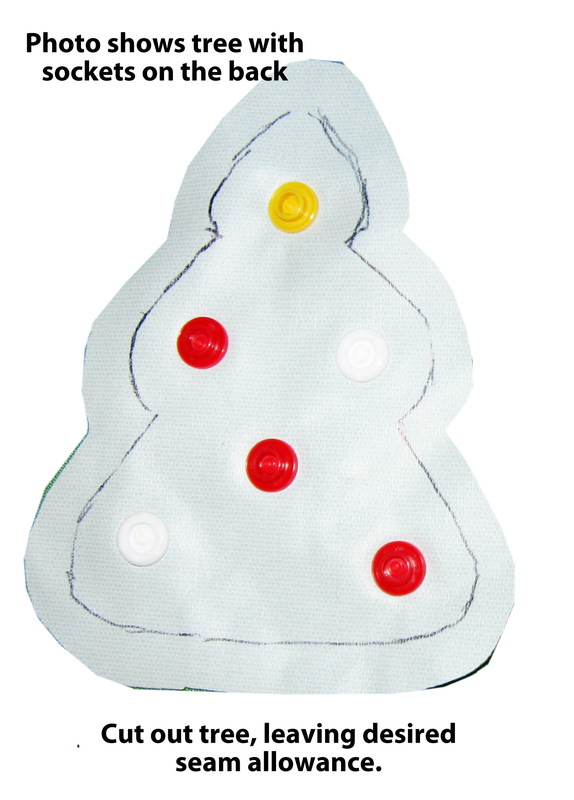 6.Turn the tree shape right side out. The trunk and loop should pop out when you turn it. Stuff firmly with polyester fiberfill. 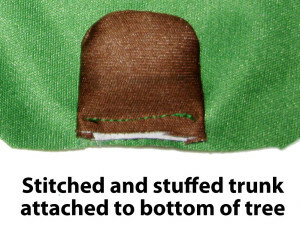 Fold the raw edges of your turning hole toward the inside, and blind stitch the hole shut with a needle and green thread, to finish your tree ornament. 1. 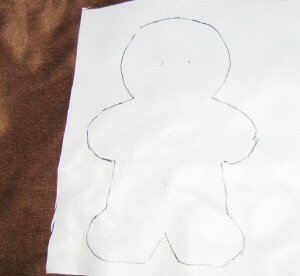 Cut out paper Gingerbread Man pattern. It does not include seam allowance. Using a ballpoint pen, trace the pattern on the laminate side of the Brown PUL, marking snap positions. Trace pattern again on front fabric side of PUL, also mark facial features and embellishment positions on the fabric side. Make sure to line up front tracking with tracing on the back. 2. Apply snaps with the caps on the fabric side of the PUL. Using a medium width tight zigzag, sew mouth along marked line using white thread. 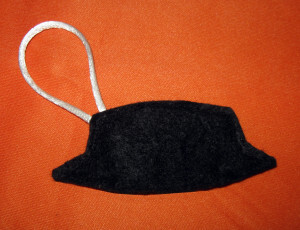 Shorten the stitch length even more, and stitch the eyes (see photo below). 3. Pin 2” pieces of rick rack across the hands and feet at marked points, making sure the ends overlap the sewing line. Stitch these down securely along the length with white thread (see photo below). 4. Make a 1 1/2” bow of the green grosgrain ribbon. Machine stitch it down securely at the center of the neck (see photo below). 5. Fold the piece of ribbon or cording into a loop, and tie a knot near the ends. 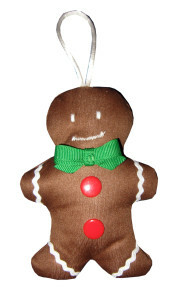 Position the loop at the center of the gingerbread man’s head, hanging down toward the center of the man. Baste the ends down close to the edge (see photo above). 6. 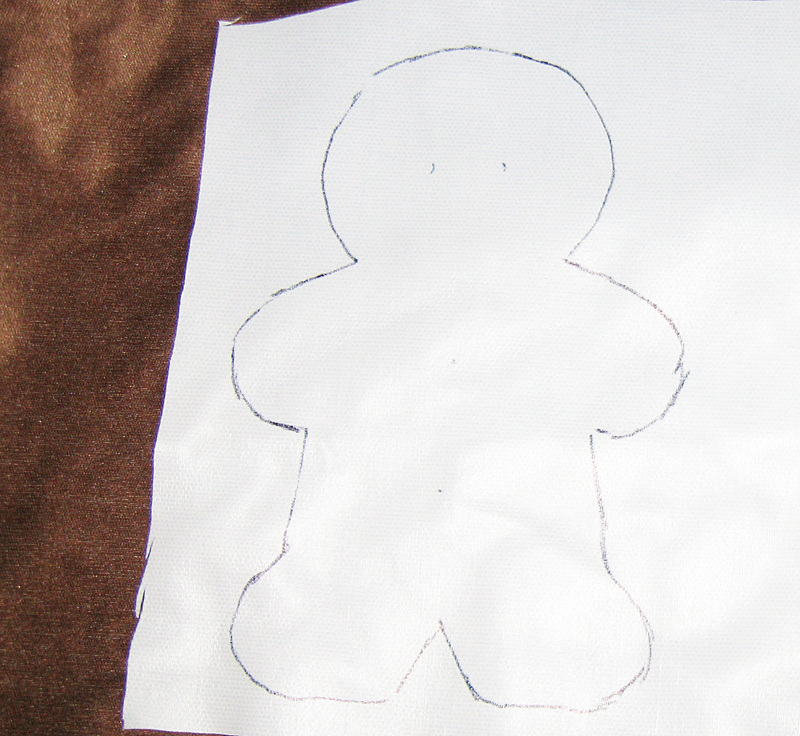 Place brown PUL fabric sides face facing, and the gingerbread man tracing is on the top. Make sure the loop is inside the shape, so it will not get caught in your stitching. Also make sure that the ends of the green bow are inside the shape, and pin them in if needed. 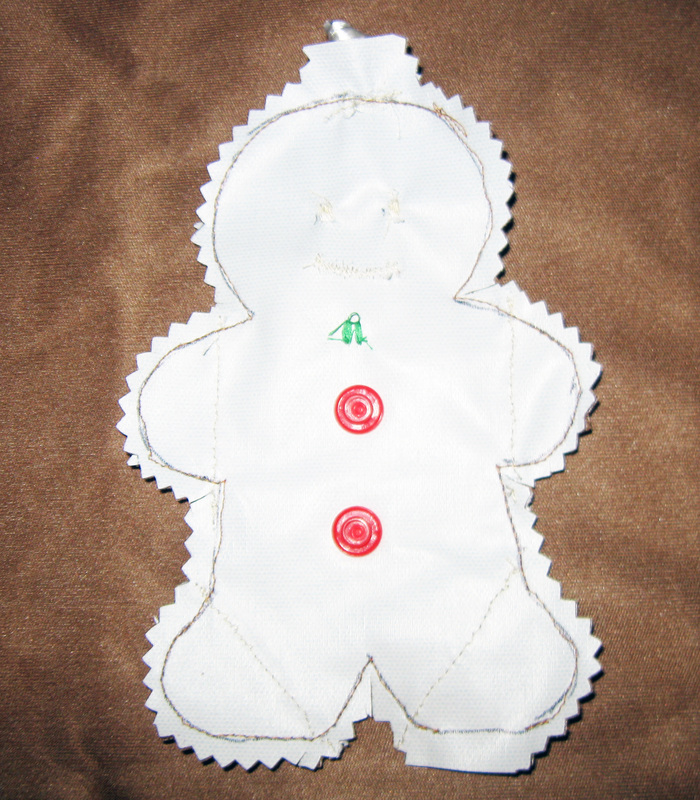 Use a straight stitch to sew around the ornament on the marked sewing line, leaving a 1” opening on a straight edge. 7. Cut around the man 1/4” from the drawn and sewn line, clipping corners and curves. 8. Turn the ornament right side out. Stuff it firmly with polyester fiberfil stuffing. Fold the raw edges of your turning hole toward the inside, and blind stitch the hole shut with a needle and brown thread, to finish your gingerbread man ornament. 1. 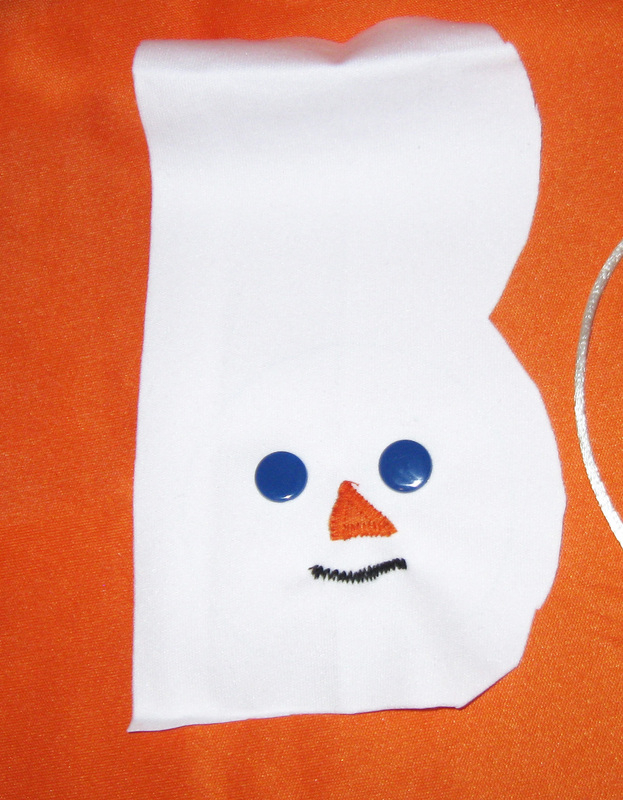 Cut out paper Snowman face pattern. It does not include seam allowance. Using a ballpoint pen, trace the pattern on the back (laminate) side of the White PUL. Mark snap positions and facial features on the front (fabric side of the PUL) with a Mark-B-Gone fabric pen, being sure to line it up with the face circle marked on the back laminate side of the PUL. 2. Cut nose triangle from orange PUL as shown on face pattern. 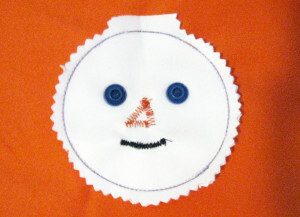 Using a medium width, tight zig zag stitch, and orange thread, sew the nose to the face, stitching around the edges. Using the same stitch, but black thread, sew along the mouth line. Apply snaps for eyes with the caps on the fabric side of the PUL (see photo below of front of snowman head). 3. Using the paper hat pattern, cut two felt hats, cutting on the line. Fold the piece of ribbon or cording into a loop, and tie a knot near the ends. Position the loop at the right hand top corner of the hat, with the loop sticking out and the knot sandwiched between the two hat layers. Pin or baste it in place. 4. 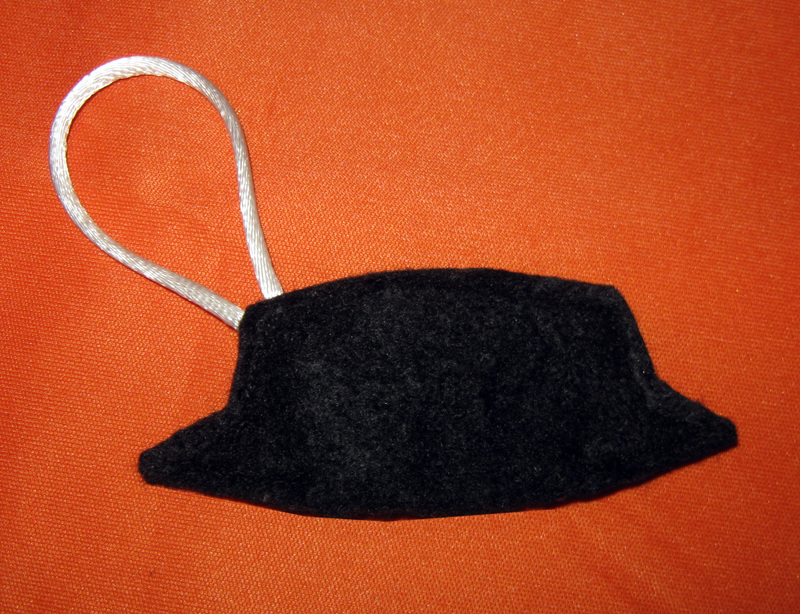 Stitch the two hats together sewing 1/4″ from edge. 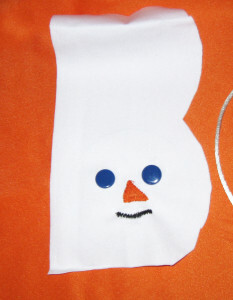 Leave the center of the hat open along the lower edge for insertion of snowman head (see photo above). 5. 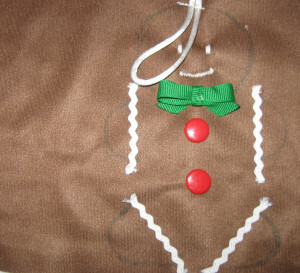 Fold the white PUL over, so that the fabric sides face each other, and the Snowman face circle is on the top. Use a straight stitch to sew around the ornament on marked line, leaving a 1” opening at the top of the head. 6. Cut around the face 1/4” from the drawn and sewn line, clipping curves. 7. Turn the ornament right side out. Stuff firmly with polyester fiberfil stuffing. Fold the raw edges of your turning hole toward the inside, and blind stitch the hole shut with a needle and white thread. 8. Place the felt hat on the snowman’s head at an angle, tucking the top edge of the face inside the hat opening, and pin it in place. Hand stitch the hat to the head front and back. 9. Fold the red ribbon in half, and tie a knot in the folded ribbon about 2” from the fold. 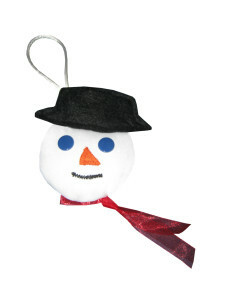 Position it on the back of the ornament across the neck area for a scarf, and hand stitch it down securely to complete your Snowman ornament. Note: Make sure the test square prints out at 1″ to obtain a full size pattern. I’ve been away a long time but 2014 is going to be the year to get this blog back in shape! I’ve got lots of great things planned, and tons of fun tutorials to share with you! The first one will be loading tonight and is brought to you from my friend Joanna at Weensy Baby (http://www NULL.etsy NULL.com/shop/WeensyBaby). Joanna is also a member of the Babyville Boutique Design Team, and does great projects for the Babyville Boutique Blog (http://babyvilleboutique NULL.com/blog). These quick ornaments were made from some left over Babvyille Boutique PUL from her diaper sewing. I love how she used snaps for the eyes. Stay tuned for this great tutorial! I’ll be taking a break from justcraftyme for a few months, to spend more time with my family, which is long overdue. I am removing a few things from my plate while while I make time to enjoy my grandchildren and a visit from my sister. 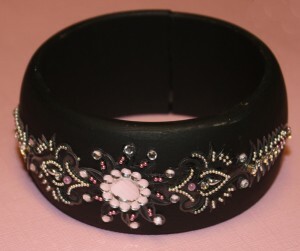 I have edited some posts to remove links that are no longer active and to update some craft projects. If you have questions on any project instructions, please pm me and I will attempt to answer your questions as I am able. Holy punches batman – check out this contest! Holy punches batman – check out Julie’s contest! Just found out that my business partner, Julie McGuffee, co-host of the popular PBS show Scrapbook Soup has a contest/giveaway on some fabulous Marvy and McGill Punches. 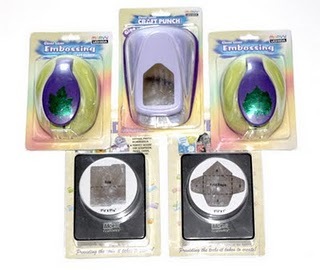 There are seriously cool punches. 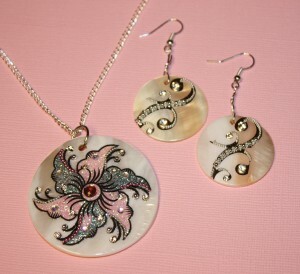 Wanted to give you a heads up so you could visit her site and register for the giveaway. Good luck hope your win! It’s a diaper sewing program! Diaper Sewing? Yep, that’s right. But these are not your mamas diapers! They are colorful and fun, and use modern conveniences like plastic snaps and adjustable tape (EZ Adjust Tape™). 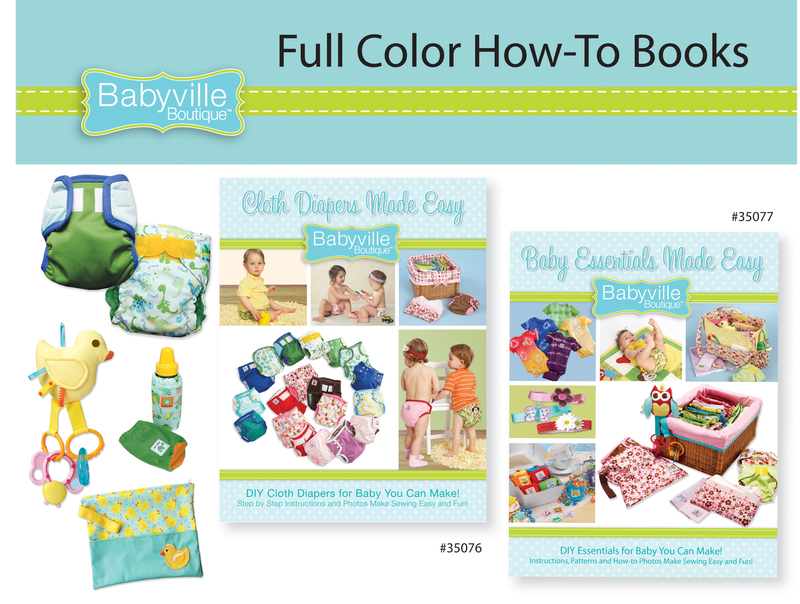 There are two books too: Cloth Diapers Made Easy! and Baby Essentials Made Easy! Each is 60 pages of full color Step-by-Step instructions for some very, very cute projects, if I do say so myself. 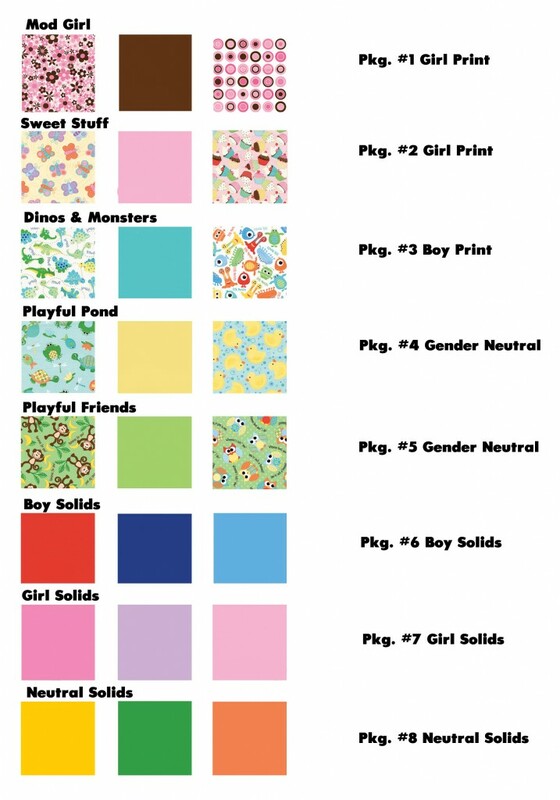 The Babyville Boutique DIY Diaper Sewing Program will be in Hancock Fabrics (select stores), JoAnn Fabrics (most stores), Hobby Lobby (all stores) and some independent fabric stores starting in September! The diaper pattern, which can be used to make a variety of cloth diapers styles, is bound into the 60 page full color instruction book “Cloth Diapers Made Easy!” which includes sewing instructions for diaper covers, and a variety of diaper styles including a pocket diaper, snail shell and more. Babyville Boutique will finally put coordinated diaper making supplies in one retail location for diaper sewing mamas, and includes PUL (10 darling prints and 13 solid colors), Coordinating FOE, Snaps, Snap Pliers, Embroidered Appliques, Embroidered Labels, Colored Hook and Loop Tape (EZ Adjust Tape™) and Buttons, plus the aforementioned Cloth Diaper Sewing Book and a 60 Page book “Baby Accessories You Can Make.” The PUL Fabric is available by the yard (double roll bolts) or in packages of three coordinating designs, with each diaper cut being a generous 21″ x 24″. Babyville Boutique is produced by Prym® Consumer USA, who makes the Dritz® line of sewing notions and other high quality product lines. I can tell you that much attention has been paid to product testing for quality and performance of all the different products. Babyville Boutique™ has been in development many months! A website and blog will launch soon with other features to inspire diaper sewing moms, including a Design Team of talented Diaper Sewing Moma!!! The site will be live in early September, but you can check out the home page now at: www.babyvilleboutique.com (http://www NULL.babyvilleboutique NULL.com) where you can sign up for notification when the full features of the site are live. I hope that these products will help all DIY diaper sewing moms to more easily find quality supplies, and will also provide WAHM’s (Work at Home Moms with cloth diaper businesses) to finally have local access for supplies. I’m also excited that Babyville Boutique will help develop awareness and introduce many mamas to the benefits of using and sewing cloth diapers. I expect Babyville Boutique to create a new demand for home sewn cloth diapers. Consumers and Mom’s with sew-at-home businesses will benefit from being able to find quality supplies at their local store. A class program is being developed and there may be opportunities to teach other moms about cloth diapers, and how to sew them at a local store. I’ll be posting the more of the color coordinated product groups (PUL, FOE, Snaps, EZ Adjust Tape, etc.) in upcoming blog posts. For new, here is a sampling of the Mod Girl Coordinates available. New Patriotic Projects and an Update! What can I say……..I’ve been busy! Next month I’ll have a big announcement to make about a fabulous program I designed (with help from my friends Ellie and Angel) for a major manufacturer. It is going to be placed in major chain and independent stores! WOW! I’m very excited!!! Sorry I can’t tell you more right now, other than it is going to be a big program that will bring something new and fun to the stores, and will appeal to 20-30’s age sewers. More info soon, I promise! Believe me, it’s hard not to tell all…..I have been working on this program, concept, design, and the pattern development! But all the hard work will be worth it! I just finished Two 60 page Books for this sewing program, and before that, Two 36 page craft Booklets “Outdoor Decor” and “Picture This”. The “Outdoor Decor” book contains fun painted designs for outdoor projects using Patio Paint, and “Picture This” features painted and mixed media frames and photo memory projects. All the books are at the printer…..the painting books will debut later in July, and the sewing books in late August. So, it’s been a really, really busy couple of months. I’ve neglected JustCraftyMe, and all my friends here. And, I have lots and lots of prize mailings to catch up on too! I’ll try to send out notices by the middle of this month, and get everyone’s prizes out and mailed…..so sorry for the delay. Life just happens! Soon, we can start with some NEW contests and free craft goodies! Can’t wait to share the crafting love with all of you. And I can’t believe that it’s almost July 4th. So how about spending some crafty time this weekend with the kids and paint one of the colorful projects? 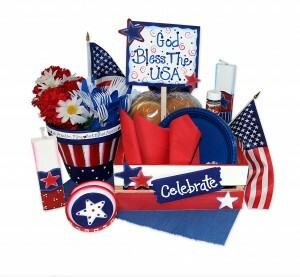 There is a Patriotic crate, clay pot coasters, USA Blocks, just to name a few. All take under and hour to make. You can adapt the ideas to any holiday…..just change colors and design icons for Christmas or Halloween. I’m looking forward to getting back with you here soon. Till then, happy 4th and happy crafting! 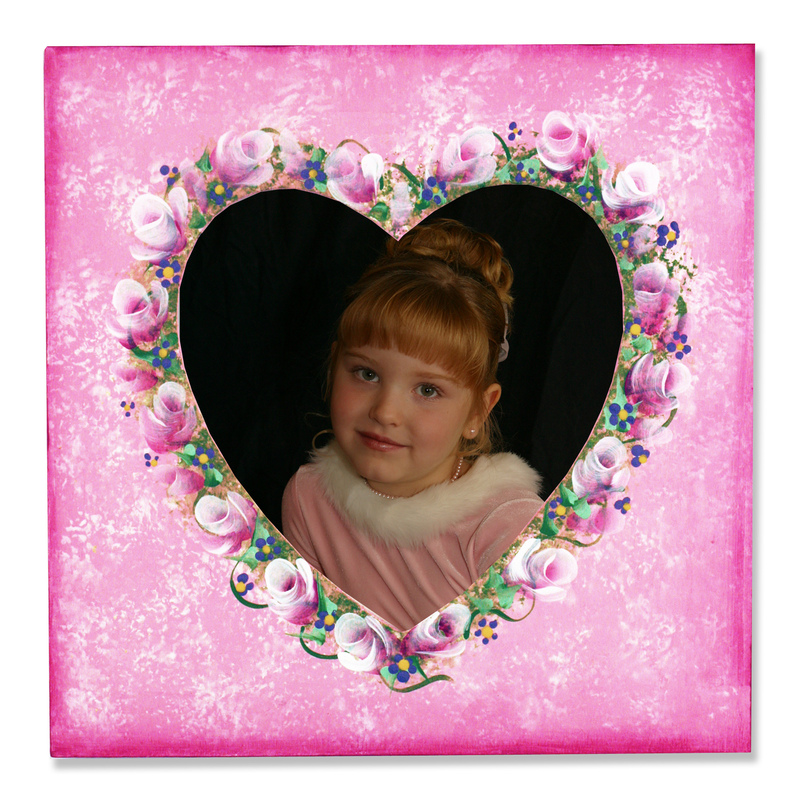 February Crafty Projects – Valentines for You! Well, it’s been a busy couple of months. My new sewing program is almost ready, it will be presented to a major chain store next month, please keep your fingers crossed for me! As soon as everything is settled, we’ll have a separate web site especially for it, with lots and lots of creative fun! Till then, it’s time I shared some of my current projects with you, let you know what I’ve been up to. These new Jewelry Art Stickers are simply amazing, very detailed and dazzling! Everyone in class really liked working with the Jewelry Art Stickers…it’s like making cool 20 second jewelry. Just peel and stick the Jewelry Art Sticker on your surface: a shell blank, metal or wood disc, glass bead, wooden bracelet, etc. These stickers ship to the stores in March, so be sure to check your local store for them. What’s new, and trendy and so cool I almost can’t stand it? 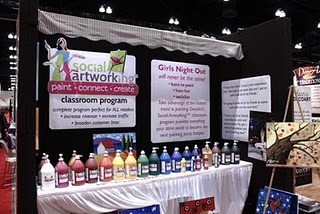 Well… it’s DecoArt’s new Social Artworking Program! This is a learn-to-paint program I WANT TO TEACH! Wow! All I can say is DecoArt really outdid themselves with this one. Fabulous class supplies formulated in instructor/class sizes, beautiful trendy patterns to create an 16″ x 20″ canvas and consumer packaged supplies to continue your painting fun at home. 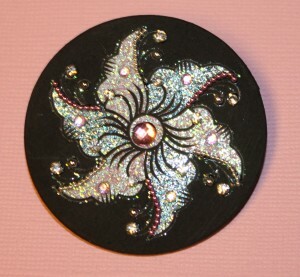 This is the kind of class that is fun, crafty, and a social event all in one. You’ll do your wall canvas art painting on an easel with 5 basic brushes and DecoArt Americana Acrylic paint colors specially selected to help you create your own masterpiece. Did I mention there will be a cool instructor there in class to encourage you and guide you along the way to painting perfection? See you again soon with more crafty fun! 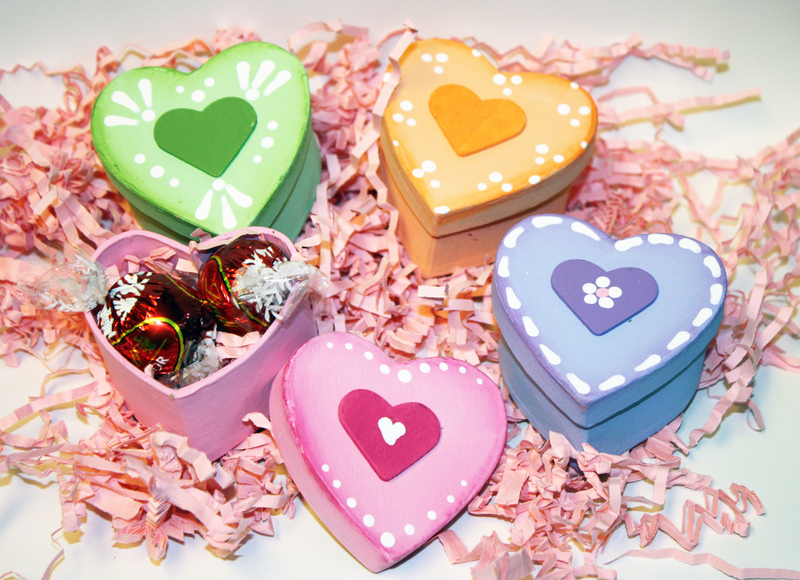 Valentine Boxes – You still have plenty of time to make these for your sweetie, or just change the colors for Easter or Mother’s Day gift boxes! Fill them with little gifts, candy, etc. Or, paint them in wedding colors to use as place favors. You can decoupage a name on them and use as a place card and favor all in one. I love roses and I know you’ll enjoy painting these simple crafty roses to make a romantic frame, painted box. The frame only costs $1.00 at Michaels, so this is a very economical project. 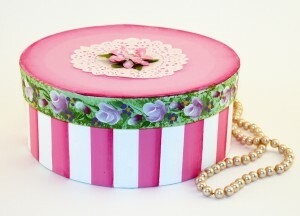 It would look sweet in a little girl’s room, and would also make a great gift for Mother’s Day. I can just see a picture of Grandma and a sweet little one in this frame! Romantic and easy-to-paint roses, give this one a try! Don’t stop your rose painting adventures with the frame – here’s a lovely painted paper mache box to make! More delightful roses to paint! 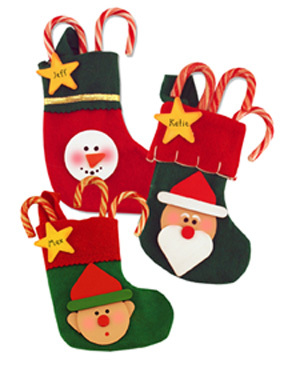 Check out these cute little felt mini Christmas stockings! These make perfect teacher gifts or party favors. Tuck a couple of candy canes or a gift card inside. They are easy enough to make with the kids, so craft up some family fun today.